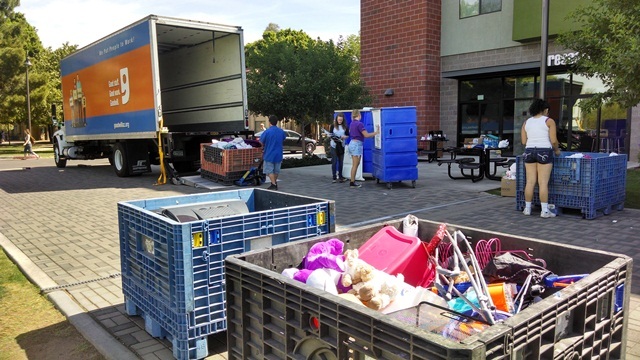 Massive donation bins loaded with unwanted clothes, dorm room appliances and other items lined the walkway by Prescott Hall on Friday as students moved out of campus residence halls for the summer. Goodwill of Central Arizona collected the clothes as part of a new program with local colleges to cut down on environmental waste and to fund efforts to provide no-cost job training to underprivileged people. Donations collected at GCU dorms last week will raise money for Goodwill of Central Arizona job-training programs. 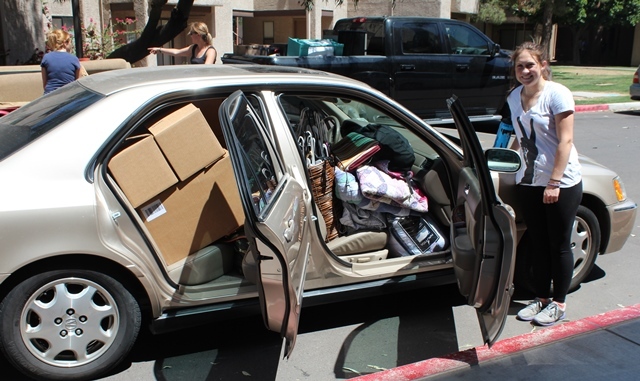 Mindy Pieper, donation drive coordinator for Goodwill of Central Arizona, said Grand Canyon University students dropped more clothes than expected into the bins stationed at campus residence halls throughout move-out week. The donation drive is a Goodwill pilot program. GCU and Arizona State University are the first local colleges to participate. With 3,700 students on campus at GCU and thousands more at ASU, the idea is to reuse and repurpose goods. “There are so many clothes, and that takes a lot to break down in landfills,” Pieper said on Friday as she helped volunteers load the bins into a truck. Goodwill of Central Arizona estimated that its efforts spare Arizona landfills from as much as 100 million pounds of waste each year. GCU student Danielle Davich sorts through donation bins at Prescott Hall. Some GCU bins were filled with jeans, shirts and shoes that could easily fetch a few bucks in one of Goodwill’s local retail stores. But even items like a pair of old shorts that might not make it to a rack in a store could be washed and used as a rag in a warehouse, she said. “If we’re not able to sell it in a store, we can still recycle it,” Pieper said. Pieper added that most items will get sold to raise funds to support the job-training programs that Goodwill hosts around the Valley, Prescott and Yuma. Those courses are designed to help struggling residents develop skills, position themselves for job interviews and learn how to become more self-sufficient. Of course, GCU students and staff pitched in. 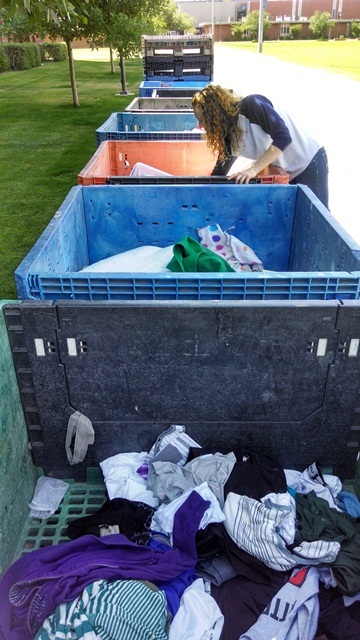 After wrapping up her junior year in GCU’s dance education program this year, Danielle Davich and a few other students volunteered to help sort through the donation bins on Friday. Older TVs, crockpots and lamps found their way to the Goodwill truck. Matt Hopkins, who oversees GCU’s office of Residence Life, said campus trash bins appeared noticeably cleaner last week since students used the donation bins to drop off clothing and larger items. Three bins at one residence hall earlier in the move-out week were “all overflowing” with donations, Hopkins said. Fleets of vehicles, ranging from pickup trucks and SUVs pulling trailers to compact cars and two-door coupes, lined the road beside Prescott and Sedona Halls as the final crop of students attempted to fit their remaining possessions into vehicles to make the trip home for summer break. All undergraduate students not staying on campus for the summer had to vacate by Friday afternoon. Graduated seniors had until Monday. For a few students, simply packing their cars was no small feat. Cady Cartwright compared the three-hour process of packing her Acura to playing a game of Tetris. Cady Cartwright, who is 5-foot-2, spent nearly three hours cramming boxes, bags, backpacks, suitcases and a year’s worth of belongings from her second-floor North Rim Apartment room into her compact Acura. She was one of the last residents to leave campus and moved everything by herself. Her parents, who work in Tucson, were unable to take off work to help pack. Even after packing for three hours alone in the searing Arizona sun, Cartwright had a smile on her face as she departed campus. Reach Michael Ferraresi at michael.ferraresi@gcu.edu or 602-639-7030 and Cooper Nelson at cooper.nelson@gcu.edu or 602-639-7511.